Between 1939 and 1945 Cecil Beaton produced a major body of photographs for the Ministry of Information. Imperial War Museums now hold the material, which consists of 7,000 prints and negatives. At the time of Beaton’s official appointment following the outbreak of war, he was a prominent figure with numerous connections in English society and was recognised as a gifted portrait photographer with a great eye for fashion and theatre. He was to become a celebrated costume and set designer for the stage and cinema. In the summer of 1939, on the eve of war, he had been commissioned to photograph Queen Elizabeth at Buckingham Palace. Beaton was to become the greatest of royal portrait photographers and photographed the Coronation of the current Queen in 1953. He regarded himself as a loyal servant of the monarchy and the nation. Despite his glamorous life on both sides of the Atlantic, he always considered England his home and the source of his creative nourishment – a fact he reiterated throughout his extensive diaries. Kenneth Clark, the young Director of the National Gallery during the war, was an advisor to the Ministry, and through his offices Beaton was set to work photographing on the home front. He began to record the destruction of the Wren churches in the City for History Under Fire (1941), a book he published with James Pope-Hennessy, and then broadened his scope to record the wider devastation of the Blitz, the heroic defence of the city and its citizens under fire. At the invitation of Fighter and Bomber Commands, he conducted a survey of the RAF, much of which was published at the time with Beaton’s astute written commentary. He was an effective propagandist, but his voice, like his photographs, was touchingly elegant. Whatever his subject, Beaton was always a stylist. In 1942, Beaton sailed on a convoy for North Africa. After an introduction to the exoticism of Alexandria and Cairo, he left for the Western Desert, where he was to produce his most dramatic abstract studies of the detritus of war in a landscape he described as surreal. 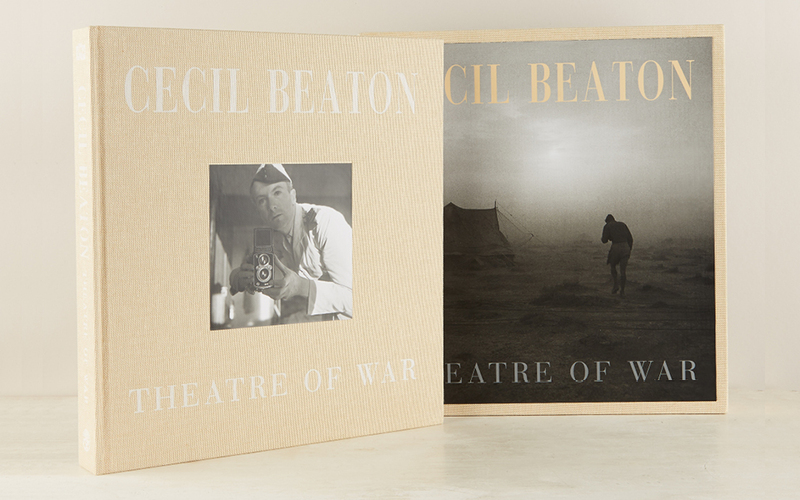 Beaton recorded the hardships and physical extremes experienced by the troops, just as he registered the sometimes sublime beauty of the desert. His travels continued that year through Iran, Iraq, Palestine, Transjordan and Syria. Beaton became familiar with courts of Middle Eastern royalty. Before leaving for India in 1943, Beaton produced a body of work reflecting the energy of manufacturing and farming at home. The shipyards provided him with a fertile arena of industrial forms and massive geometrical shapes. No subject seemed outside his realm. He was able to realise the visual potential from the most mundane as well as the most dramatic circumstances. When he reached New Delhi, the glories of Lutyens’ architecture offered him a staggering backdrop against which to record the last years of the Raj. His views of the thrones of Delhi and Calcutta were set against pictures of basic military training or Indian factory production. Outside the cities he revelled in the lush landscape. He came closest to action when he joined the Burma campaign and witnessed the terror and intimacy of jungle warfare against the Japanese. rural poverty. Even though the views were extraordinary, the experience was so physically taxing that Beaton left China drained and shattered. He headed to New York to recover.